WHAT'S SO CLEVER ABOUT THIS LOCK? So many things that we could almost fill a book, but we only have space for the most important. Firstly, this lockset has been designed especially for the caravanner to provide maximum safety, security, ease of operation and long life. Safety. A new plastic material has been used for the outside dish and handle which is self extinguishing in case of fire attack and meets the requirements of Part 5 of B.S. 2782: 1965. Security. Built into the handle next to the cylinder mechanism is a steel insert which together with the steel dish reinforcing plate gives added security. The lock itself has as many different combinations as the average car lock. Easy operation. A double sided key fits the lock, held either way round. Inside, the drawback handle is easy to use and can be locked for privacy. Long life. The lock has a sturdy press button action with a brass bolt and crisp springing. It passed easily the British Standards BS: 2088: 1954 requirement of 300,000 consecutive actions. The lock is completely weatherproof; external plastic components; internal steel parts, zinc coated; inside latch cover anodised aluminium. The brass tumbler cylinder lock has a stainless steel cap for added weather protection. 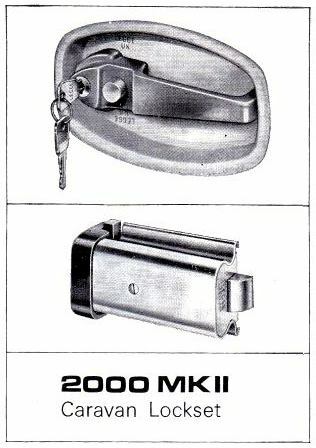 Lock-out: Some early examples of the Legge 2000 caravan door lock suffered production run faults which caused the manufacture to be held up for 12 months for re-designing. The Mark 2 version, on the market now since the 1967 Caravan Show, has been the subject of extensive development work. The 2000 is a fully recessed cylinder latch with thumb-button operated. The exterior case, with the exception of the cylinder itself, is injection moulded in hard wearing plastics. 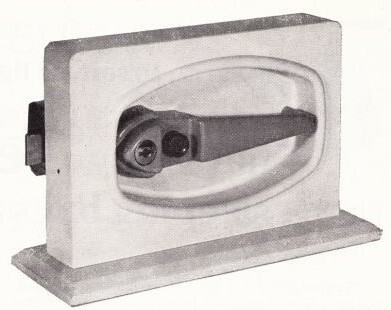 The thumb-button movement is still a little heavy but smooth; the sample locksets were, of course, new and will probably require less pressure with use. The locking action, both with the key and by the internal catch, is positively and virtually unforceable. The styling is clean and the overall appearance is pleasing. These locksets are not really for fitting as replacements (although it would be possible in certain cases) but many manufacturers fit them as standard. J Legge & Co Ltd, Willenhall, Staffs.